1. Holding flood water in the first lake. 3. Holding it in the natural valley to the NE of Blind Lane. At a meeting with N&SDC, Oxton Estates and the Parish Council the third option was favoured as it involved less cost and held the water outside the village. Accurate information was not held by JBA, but this has now been provided by NCC. The next stage will be a full survey of option 3 by JBA and N&SDC are seeing if they can fund this from existing resources. The village flood plan has come a long way since my July report and is now almost complete. When it is finalised a summary of it will be posted on the website. Currently the flood committee members are collecting names and contact numbers of those who were directly affected by the 2007 flood so that they can be alerted in good time by the flood wardens should the unthinkable ever occur again. Below are the conclusions and recommendations of JBA taken directly from their report and further details of the favoured option 3. 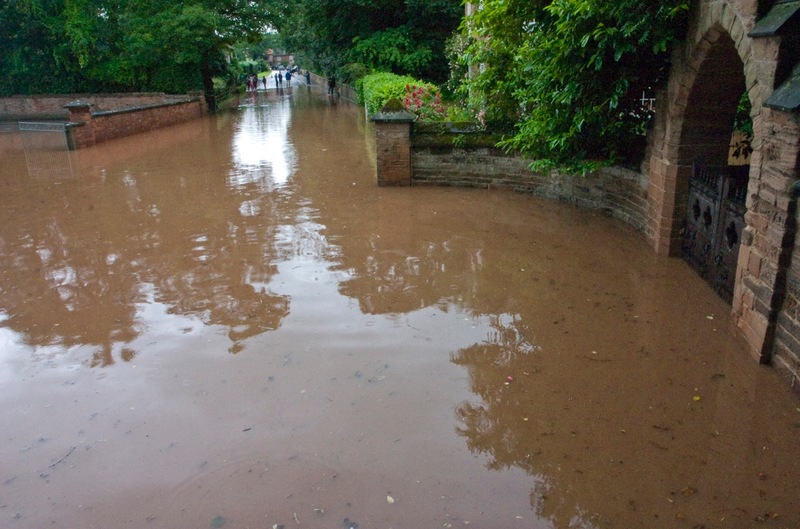 A feasibility study has been carried out to consider potential solutions to flooding issues on Oxton, Nottinghamshire. This study follows on from the “Oxton Flood Relief Feasibility Study” carried out by JBA Consulting in March 2010. The existing hydraulic modelling of the local watercourses (Oxton Dumble, Sandy Lane Diversion Channel) was extended to investigate solutions against flooding of properties in Oxton. No LiDAR data is available for the study area, so the effect of out-of-bank flows from the ponds, which are believed to contribute to flooding in Oxton, could not accurately be assessed. Option 1: Modify existing Sandy lane flow control structure to reduce discharge into Oxton Dumble and erect flood defences along the Oxton Estate ponds. Option 2: Reduce flows entering the lower pond and provide flood storage in the upper pond by increasing bank heights where required. 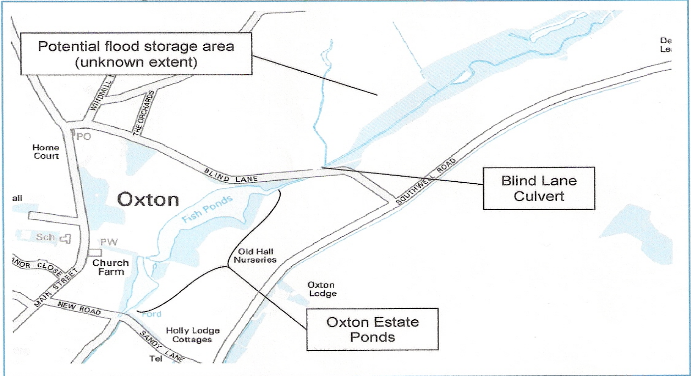 Option 3: Reduce flows entering the Oxton Estate ponds by restricting the capacity of the Blind Lane culvert and providing upstream flood storage. Hydraulic modelling of these three options was carried out and it was demonstrated that all three options would provide a feasible flood alleviation scheme, but will require some raised defences to be provided alongside the scheme. Due to the complex nature of the river network on Oxton and limited topographic survey data, a detailed assessment accurately representing where flood embankments are required could not be made within the scope of this study. It is acknowledged that the hydraulic model does not provide a complete representation of out-of-bank flows and their effect on flood risk, due to the lack of topographic data for the area. To reduce these uncertainties it is recommended that a topographic survey of the land surrounding the ponds be carried out to identify these so they can be better represented within the model. The mapped location of defences has been shown only where a topographic survey was carried out along the banks of the ponds. It may be that there is natural high ground nearby which forms a natural defence against flooding. Additional topographic data of the local area will identify surrounding high ground, perhaps allowing the required extent of raised defences to be reduced. If wider topographic data is made available, it is recommended to re-run the hydraulic model and compare the new modelling results to those quoted in this report. Additional topographic data will allow a more accurate assessment of flood mechanisms and out-of-bank flow routes which cause flooding in Oxton. As a result, a more cost-efficient scheme could then be designed by making the best possible use of high ground areas and tying the proposed flood defences to these. 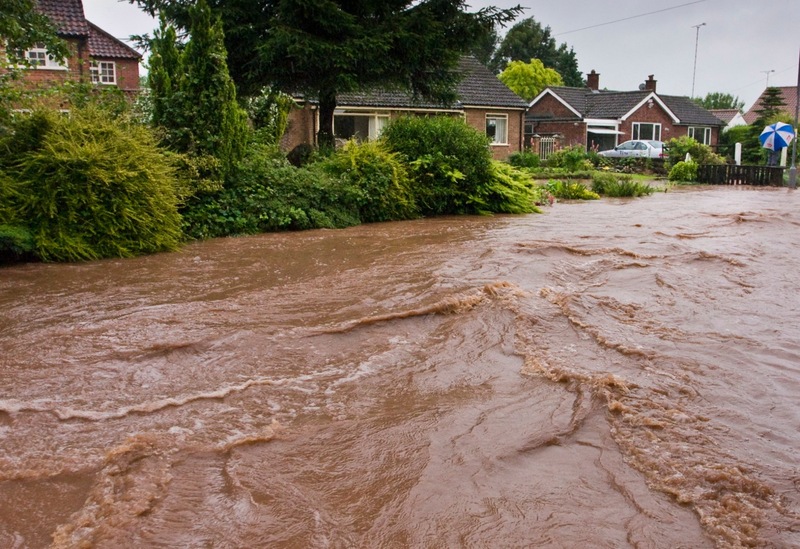 Any selected flood mitigation option will ideally require extensive modelling, considering numerous return period events and storm durations, to ensure they will be effective in a wide range of events. If it is found that the scale of works are too great or not cost-efficient, individual property protection measures could be considered as an alternative to protect the properties that are at most risk. This option assumes the Oxton Ponds will not provide additional flood storage than their current conditions. If this is the case, it is proposed that the area upstream of Blind Lane could form a flood storage area, with flows through the Blind Lane culvert restricted so that they do not cause flooding in Oxton and reduce the likelihood of the upper and lower ponds overtopping their banks. This would be achieved by reducing the flow capacity of the culvert beneath Blind Lane, which will cause excess flows to back-up upstream. The diagram below shows a conceptual representation of the scheme.